Soba Dojo Inakaya is a Soba restaurant located in a little village called Kusama in Nimi city, Okayama. 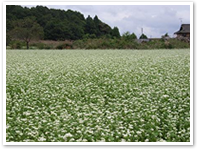 Peaches, grapes, tabaco and Soba are cultivated in Kusama and since Edo period Soba has been popular dish. Soba noodles are native Japanese noodles made of buckwheat flour (soba-ko) and wheat flour (komugi-ko). They are roughly as thick as spaghetti, and prepared in various hot and cold dishes. The most basic soba dish is zaru soba in which boiled, cold soba noodles are eaten with a soya based dipping sauce (tsuyu). 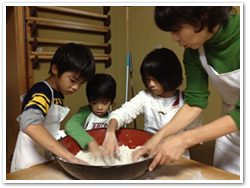 You can try making Soba in our restaurant, the cost depends on how many people are in the group.